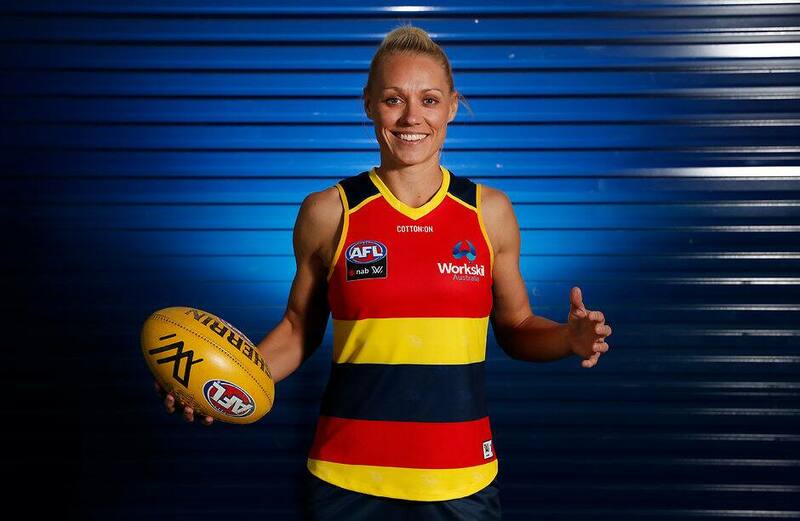 Adelaide superstar Erin Phillips is counting down the days until the start of the 2019 NAB AFL Women's season after a quad injury interrupted her 2018 campaign. The 33-year-old was the most dominant player in the inaugural AFLW season in 2017, winning the competition's best and fairest award and leading the Crows to the premiership. However, a quad injury suffered on the eve of last season kept her out of the first two games, before she reaggravated it in the final round of the competition. The former Australian Opals basketballer spent the off-season in the United States as an assistant coach with WNBA club Dallas Wings while also training at the Michael Johnson Performance Centre outside of Dallas. "We did a few different stages of my training, including working on my running technique, where we went back to basics," Phillips said. "It was about learning how to run properly, which is something I've never been taught. "So far, I feel great." Phillips has to limit how often she kicks the football and has her running loads carefully monitored. After missing the first two games of last season, Phillips returned to boot four goals in the Crows' win against the Western Bulldogs in round three. She fought on until re-injuring her quad in the last game. "It was such a small injury, but (the type that) if you kick on it, you're going to make it worse," she said. "There was nothing I really could do. "After round two, I kind of rolled the dice. It felt OK (but) it didn't feel great, and then I tried to play on it. "The game against Collingwood, it went again…and I couldn't kick." "I've learnt a lot from last season and I've learnt a lot from working with the Michael Johnson Performance Centre." Phillips has no plans to hang up the boots, using her brother-in-law, Hawthorn veteran Shaun Burgoyne, as inspiration. "I feel if I keep doing what I'm doing, I definitely haven't put a date to the end of my career," she said. "I just look at Shaun – I saw it's his 19th pre-season. "I thought, 'Wow, if he can do it, then I can get a few more out of me'." Phillips was speaking at Norwood Oval on Monday afternoon where the Crows will start their 2019 campaign by hosting the Western Bulldogs on February 2.